I have a theory that the earliest (late 70s) Navigator LPs - specifically, the ones with either a headstock volute, or the later ones with serial numbers on the back of the headstock - will have larger (wider) headstock dimensions than my newly acquired Navigator. As you can see - the width is approximate 75 mm at the top. And, at the bottom, the width is slightly less than 70 mm. Probably around 69 or even 68 mm, to be exact. 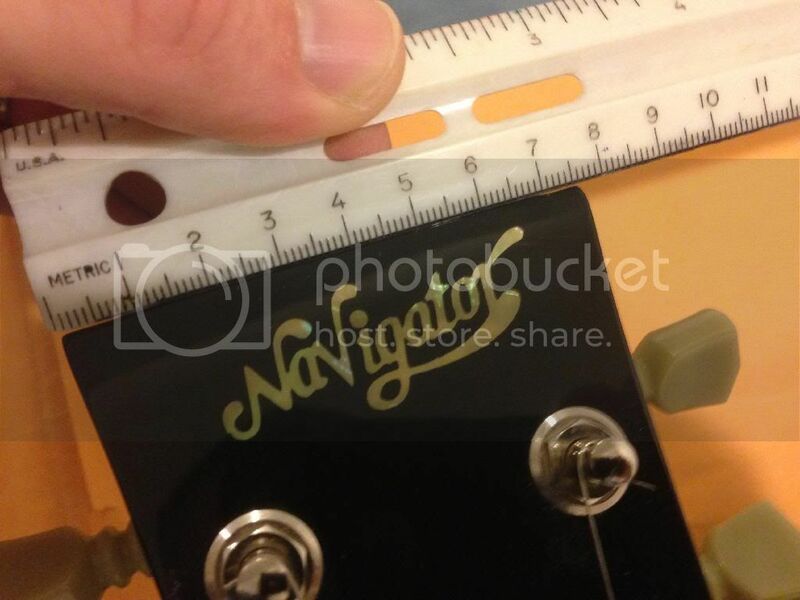 Again, to those who have early Navigator LPs with either (1) a headstock volute, or (2) a serial number on the back of the headstock, I would be very interested in what your guitar's headstock measurements are. 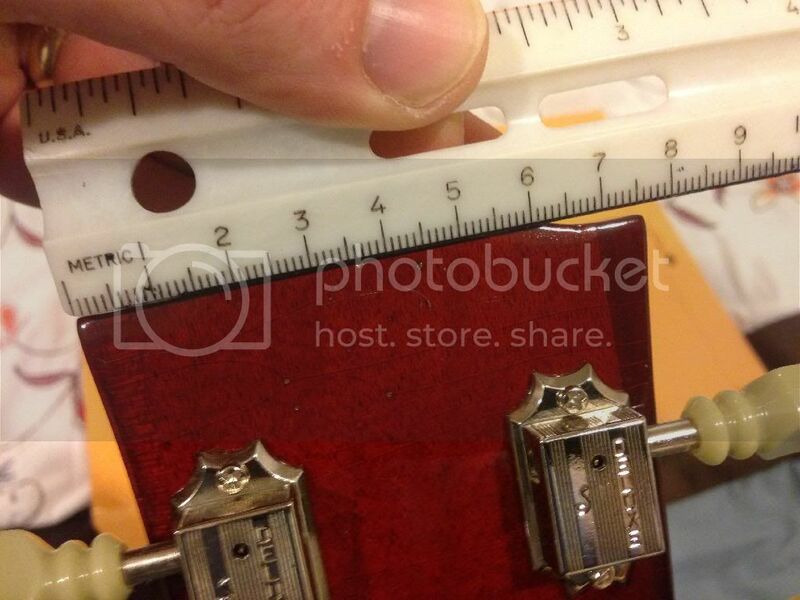 My guess is that, if you have one of those earliest Navigator LPs, your headstock will measure wider than these measurements I just photographed. I think they are all the same. I have had from 1978 83 and 88, even Udos 2001 looks like it will be the same. Funny because even through the different makers that has remained the same. Why dont you put these type of threads under the ESP Edwards NAV theory thread. That way all info is in one spot. Mine is also 77mm width top of headstock, 69mm bottom. It is a no serial, no volute, looks similar to yours. 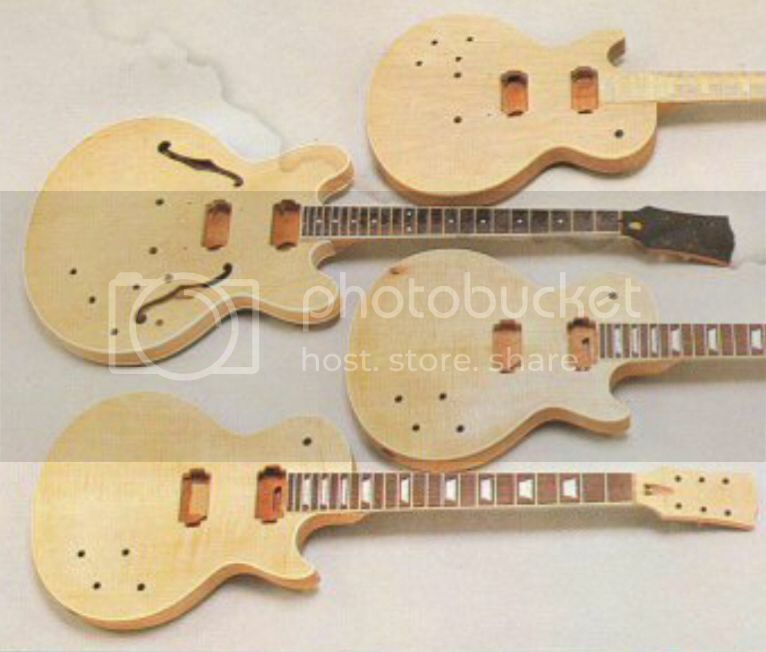 Only different tenon, one piece neck (no headstock wings) and one piece body. 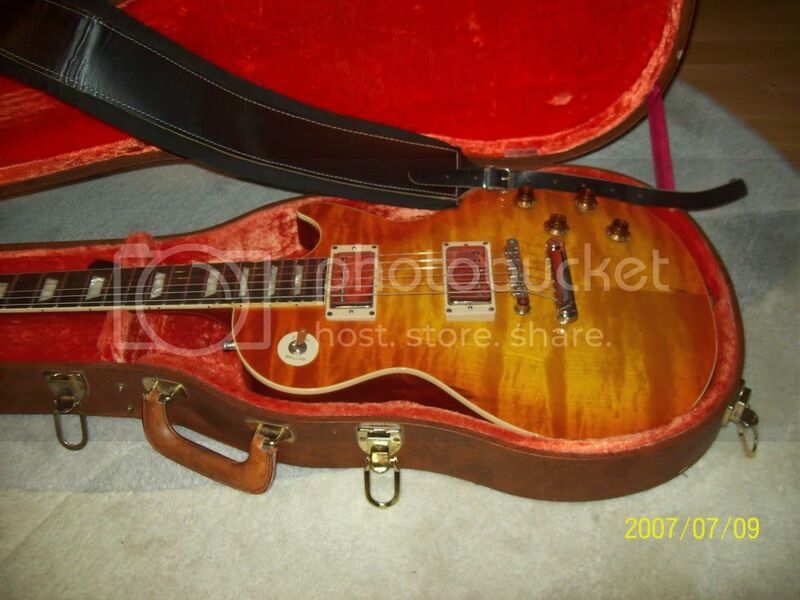 Different tuners too, they look similar, but mine say ESP on the back. Rodion - thanks so much for the measurements! 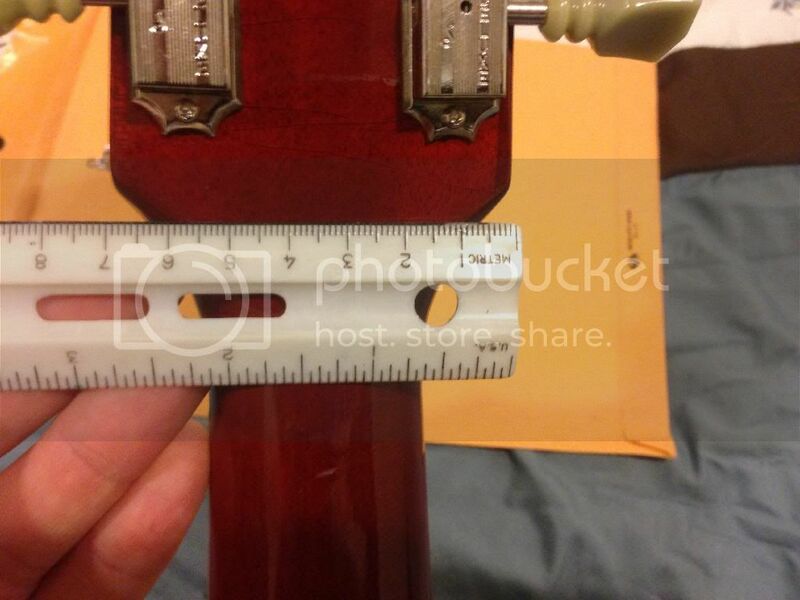 So, yours and mine are the same headstock widths. I'll let you guys in on my thinking here - JDB, this is something I can repeat in the Navigator thread, so it can be there as well. -Gen1 (1976-77): ES-12 and ES-13 models, basically a mid-70s style LP including headstock volute; some had Les Paul headstock script; no serial number. Easiest defining characteristic: volute. -Gen2 (1977-80): start of the LPS models (lowest model LPS-75, highest model LPS-200, no volute, large/wide headstock, some early ones had Les Paul headstock script, usually an impressed serial # (sometimes with ink into the impression) which was in "0100" or "100" format (so sometimes no 0 in front), short tenon completely invisible from neck pickup cavity; usually a very short heel. Easiest defining characteristic: combination of no volute and short (completely invisible) tenon, and likely an impressed serial number. -Gen3 (1980+): start of the more "vintage-correct" LPS models (lowest model LPS-90 or maybe LPS-100), highest model LPS-350, no volute, small headstock, no Les Paul headstock script, no serial #, longer tenon now visible from within neck pickup cavity (earliest Gen3 visible tenons were apparently just barely into neck pickup cavity, but later ones went about 40% or so into the cavity), tenon has 90 degree angles instead of being cut/angled at the corners, cavity routing where the four pots actually sit usually looks like a sunken "cross" shape, no maple truss rod filler strip. Easiest defining characteristic: combination of no serial number and neck tenon visible from inside neck pickup cavity. According to these descriptions, yours is clearly a Gen3. And I believe mine is one of the earliest Gen3s - my guess is sometime from 1980, which I believe was the transitional year from Gen2 to Gen3. If anyone has a Gen2 (serial number on back of headstock) Navigator, I feel pretty confident that their headstock measurements will be wider. By the way, the serial number is actually not a serial number. It's a model number. I probably shouldn't have even referred to it as a serial number above. So, LPS-100 would be 0100 (or sometimes just 100, without the 0 in front), LPS-200 would be 0200 (or just 200), etc... Simple! I think that most of the confusion out there is the lack of understanding between Gen2 and Gen3. I believe that a close inspection of Gen2 vs. Gen3 Navigator LPs would show many differences: construction, dimensions, etc. I think the Gen3 was basiclly a complete redesign, in 1980, in an attempt to compete with the likes of Tokai in terms of "historical accuracy" (and at a price point basically double Tokai's prices at each competing model level). Have any pics of the wider head stock? A late 1979 or early 1980 Gen2 (just before the change to Gen3), model LPS-75 (0075 on back of headstock). So, am I just losing my mind? Or do these Gen2s have a curvier, wider looking headstock shape than the Gen3s? Note also that this pictured late 1979/early 1980 LPS-75 has my *exact* same tuners (double ring, same exact model and logo, just in gold). I truly believe that this LPS-75 is a perfect example of late Gen2, with mine being among the very earliest Gen3s. Probably also why the routing for the four pots inside my control cavity was obviously done freehand - they were still trying to transition to the newer Gen3 production methods. Check out the 1981 ESP catalog. It is actually dated January 1981, so what you are really looking at is a snapshot of Navigators as of the second half of 1980. This January 1981 catalog was the first appearance of an insanely accurate Lifton case - much more vintage accurate than anything Tokai or Greco was doing at that time. This is the same Lifton case from the January 1981 ESP catalog. Bottom line, here is what I think: In 1980, Navigator made a huge turn towards an attempt at vintage accuracy, with the Gen3s. I think the Lifton case they made starting at that same time also shows their apparent new commitment to an attempt at vintage accuracy. If the pickup is original in the link you posted then that would date the guitar to 1977 ( assume this is gen 1 which would be the earliest I have seen so maybe first year production. The headstock to me looks more like a custom model head shape and the routings a kasuga. My 1978 dated by the pickup codes has the model number serial and the slimer headstock so I would say the larger head on a standard was only for a year or so. Then late 1978 1979 1980 1981 are still gen 1 and still kasuga made with some differences in tenons. late 1982-83 I think they started manufacturing at ESP. (gen 2) to date with advances in tenon length etc. I really do think that the Gen3s started in mid-1980. Check out the 1980 catalog compared with the 1981. (Keep in mind that the dates of the catalogs are January, so in reality, the photos are likely Fall 1979 and Fall 1980). The 1979 catalog clearly shows some unfinished Gen2s, complete with the Kasuga style pickup routing that you have pointed out. The 1980 catalog shows three unfinished Gen3s. Intestingly, the two on the bottom have the longer (40%) tenon, and the one on the top appears to have the earliest, "transitional" (but still visible) tenon (like mine has). I think the "transitional" (but still visible) tenon (my guitar) Gen3 was mid 1980, and the longer (40%) tenon Gen3 was the later part of 1980. I think there was definitely a lag in some of the pickup and pot codes. For example, 1978 pots or pickups showing up in 1979 or even early 1980, etc. 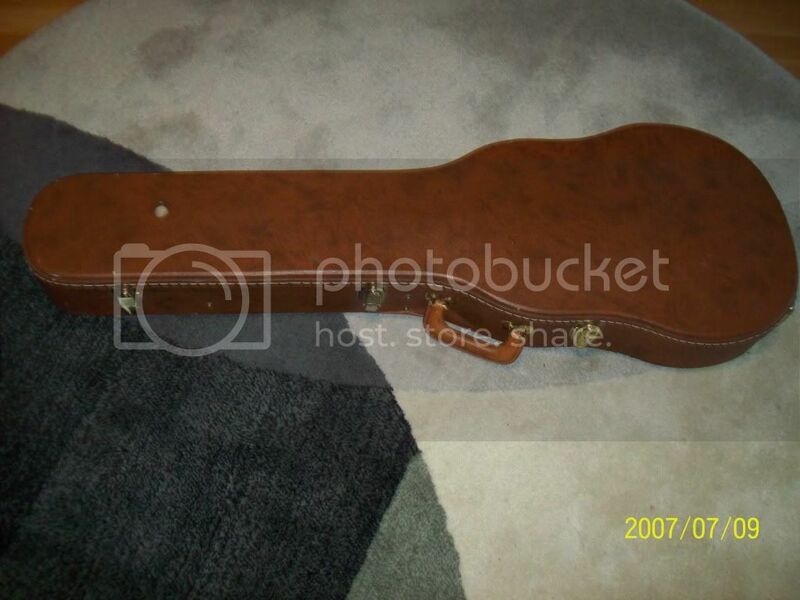 Are you sure yours has the thinner headstock shape? I thought yours looked like the typical Gen2 style - but I could definitely be wrong! 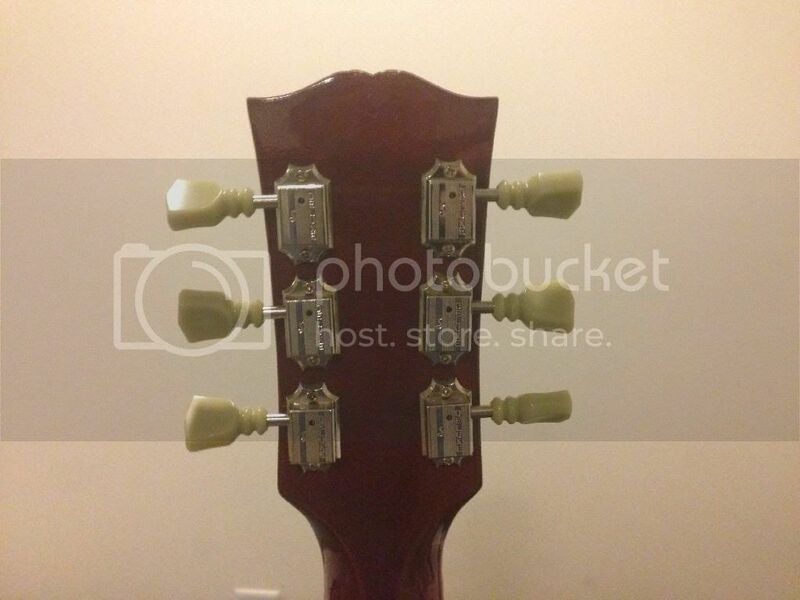 Could you post a photo of your headstock, front and back? I can definitely do the same, for comparison. I agree with you Sals on the change in 1980. This and the model type notation in stead of the serial number has been discussed and determined before in the Nav thread. Thanks for your input! By the way, I'm not saying that the Gen2s are somehow "not as good" as the the Gen3s. Not at all! I'm just trying to find the finer details of the differences between the early Navs over the years. Absolutely nothing wrong with owning a Gen2, or Gen1, for that matter - I would buy one in a second. Any other vintage Navs out there? If you had photos, we could try to place into the 3 generations and see if this all holds true. Your way, is one way of looking at it. Here's a close up of the jan 1981 catalog, you can see 2 tenon types here. I am definitely open to a different definition of the generations! I think I actually just figured something else out regarding the tenon issue on the post-mid-1980 Navs. You are exactly right - two types of tenons. Notice the two at bottom (with the longest, 40% type tenon) are figured tops. And the one on top (tough to see here, but I am betting that tenon is just like mine, visible from neck cavity, but just barely creeping into the neck pickup cavity) is a much plainer looking top. The higher-level models (maybe LPS-200 and up?) from post-mid-1980 probably had the longer, 40% tenon. This would explain the two different tenon types that appear in that January 1981 catalog. Based on comparing my (what am guessing is) LPS-100 (multi piece back, shorter tenon) to rodion's (what I am guessing might be a) LPS-200 (one piece back, longer 40% tenon), the two guitars otherwise appear to look the same and have the same dimensions and shapes. Gen1: all made before mid-1980, defined by a lack of *any* visible tenon in the neck pickup cavity. Earliest had headstock volute (ES-12 and ES-13 models from the first two catalogs in 1976/1977), sometimes feature Les Paul script on headstock, curvier/wider heastock shape, later had no volute and featured model number on back of headstock. Due to similarities with LPs made in the Kasuga factory, some believe these were outsourced and built by Kasuga, although some still insist they were made in-house. Gen2: from mid-1980 forward, visible tenon inside neck cavity, length of tenon depends on model level, basically agreed that these guitars were made in-house rather than outsourced production to another factory. Could just be camera angle, but do you see any difference in shape? I could definitely be wrong...I am open to any comments and/or criticism! Kasuga generally did not spray in to the pickup cavities (at least all the examples I have owned and seen). They seemed to route them post finish. This is basically what I said, but the reason I say the change from Kasuga to ESP made is around 1982 is that going by H. Sals pics of his NAV I see a change in Kasuga manufacturing. His control cav routing is still Kasuga but has a visual tenon and CNC routed pup cavities. So the pics you showed from the catalogue show the old oblong routes next to what look like CNC routed pup cavities could all be still Kasuga made. Also I see some changes on the ES style in 82 83 going from what I believe were a very thin neck in previous years to much chunkier and the 12th fret markers change to wider spread apart.